My father, George F. Sanborn Jr., is the photographer of this cute flower. Thanks dad! It was taken on his trip to Ireland in 1975 in an open field (this image is a scan of a faded print). Upon initial analysis, I thought this was a member of the Lamiaceae. Only after Douglas Justice pointed out that the flowers were not in a verticillaster (a fancy helicoid cyme common in the Lamiaceae a whorl of flowers apparently of one cluster, but composed of two opposite axillary cymes) did we re-examine it and determine its identity. Dactylorhiza maculata, or the heath-spotted orchid, is a source of salep, a demulcent (or film-forming substance). It is used to soothe gastrointestinal discomfort, as it coats the organs in a mucilaginous film — similar to that of arrowroot, Maranta arundinacea. The genus Dactylorhiza contains only terrestrial orchids (that is, none are epiphytic). Many of them are also tuberous. They are commonly cultivated in home gardens. 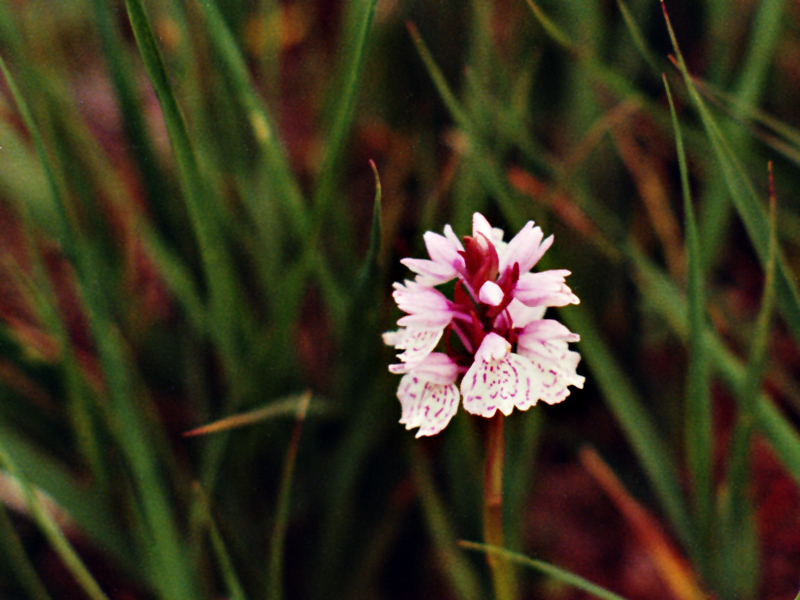 Oh, an Irish orchid. Just about right on time for St. Patrick’s Day. Didn’t know there was such a thing. I bet fairies make all kinds of things out of them–like hats. Yoicks, listen to me! encounter these way out on the lonely Burren with enchanted springs, leftover homesteads, fairies, and lotsa wildflowers…. Such a cute little flower in the middle of the field. “Verticillaster” describes whorled dichasia at the nodes of an elongate rachis. Does “fancy helicoid cyme infloresence” describe the symmetry of a dichasium? Gorgeous, Ruth! Thank you for all the work you do for our enjoyment. Upload attachment (Allowed file types: jpg, png, maximum file size: 2MB. Botany Photo of the Day: In science, beauty. In beauty, science. Daily. We'll email you as new entries are posted! We currently accept photos submitted through a Flickr group, our garden forums, or email. Please see The Photographs for more details. Some of our favourite sites! Support UBC Botanical Garden's important work by donating today.